I'm sorry I dropped off the face of the planet last week. I kinda got pneumonia and had to go to the hospital and stuff. You can listen to me explain that whole ordeal on the latest episode of Full of Sith if you're so inclined. Even though I spent 90% of my time in a fevered delirium, I still managed to sneak in a couple of hundred words a day, thereby keeping up my streak of writing every day. Granted, I may have had to rewrite a little bit of that mess, and it did set me behind schedule considerably for my own personal goals, I still feel good about the work I did to keep up my streak. We're deep in the midst of National Novel Writing Month as well, and that's helped me get back on schedule some. I've been (over the last few days) cranking out almost 3,000 words a day. It's really lit a fire under me, and that's exactly what I needed. Aside from that, my life has been pretty much just working and recovering, so I won't belabor this post. Pre-orders help authors more than you can ever guess and I would humbly ask you pre-order my books (and those of other authors you like) if you can. Escape Vector is out, completely. You can buy the book digitally and in print from Amazon, or you can order a signed copy from me here. The first review of Escape Vector is in as well, and it comes from my good friend and fellow writer Dawn Pink. The worlds built are as stunning and intricate as space itself and the author brings them to life without bogging down the text with description. My favorite aspect of the anthology, however, is the author brings to life female characters in ways not often seen within the genre. As both protagonist and antagonist, wearing hats of white, black and grey, he explores the idea of the female character as human, not woman, which is refreshing, not only for this specific subgenre of science fiction, but especially for a male author. Space battles, a ghost story, origin stories, bounty hunters, and narrow escapes, Young is able to add something important to the standards of speculative fiction while taking his reader on a thrilling joy ride. So, that's a hell of an endorsement and I hope it aids in your decision ot check out the book. The next thing on the list tonight Star Wars Insider #161. 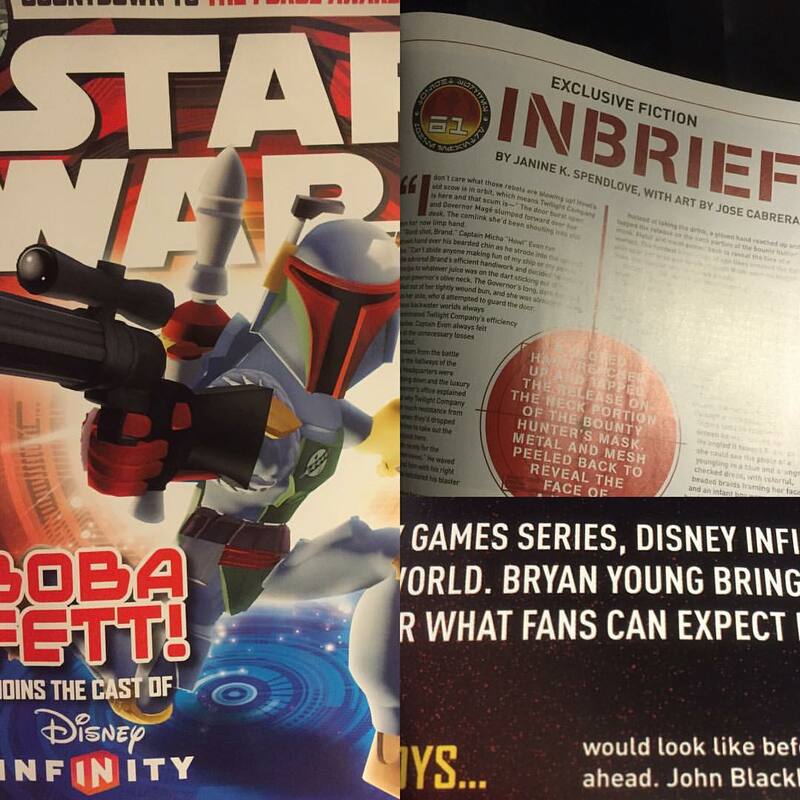 This is probably the most meaningful issue of Star Wars Insider I've been involved with to date. I got one of the cover stories in the magazine, which is cool in its own right. It's an exclusive look into Disney Infinity 3.0, which is awesome. But the most awesome thing about it isn't anything I had to do with. It's that this issue marks the Star Wars fiction debut of one of my best friends and authors, Janine Spendlove. The two of us met for the first time in line for The Phantom Menace and love of Star Wars and love of writing has kept our friendship strong for the last 16 years. We've laughed and cried together many times and for the two of us to be represented in an official capacity in the official Star Wars magazine as writers like this... well... It's something special to me. I didn't expect it to hit me like it did, holding it in my hands, but it's an achievement I don't think I would have, could have, ever dreamed of, sitting there as a kid in line for Episode I. Until further notice, this is officially my favorite issue of the magazine. Other things I wrote that were published! I wrote a piece about what you need to know going into The Force Awakens for Salt Lake City Weekly that you can read here. And my latest in the "Cinema Behind Star Wars" column tackled the Japanese animated film Akira, and you can read that piece here. As far as other stuff I'm working on, I'm still plugging away on my novel and now I have two top secret projects I'm involved with. I'm also going into revision mode on two other manuscripts I've written, working to get them into shape to send to agents and publishers. And I've got a couple of nagging ideas for short stories I might start working on. In any case, I won't be slowing down.